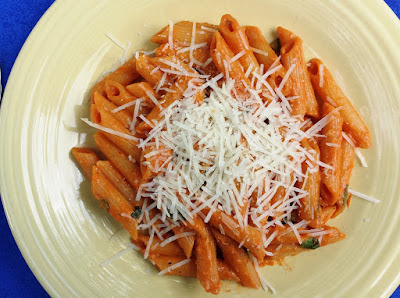 Sometimes simplicity is deceptive.... Today's pasta sauce is a good example. Other than its brilliant...almost neon...color, one might be tempted to pass it by as plain and boring...there just isn't much to see. The few ingredients are cooked in a straightforward way and then puréed into a smooth and uniform sauce. Visually, it could probably pass for baby food. But when you put what turns out to be a rather silken textured sauce in your mouth, you find that it sings with the concentrated flavors of sweet ripe bell peppers and tangy summer tomatoes. Furthermore, it has a pleasant but unobtrusive kick from a generous pinch of hot pepper flakes...as well as a few nice aromatic exclamation points from a handful of shards of sweet basil. It is anything but boring... The few ingredients surprise with their collective intensity of flavor. 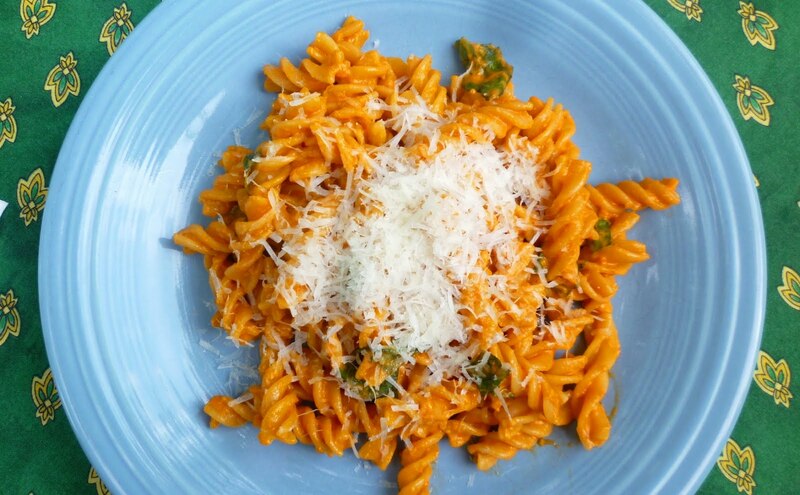 I ran across the recipe for this pasta in one of my favorite pasta cookbooks—Four Seasons Pasta by Janet Fletcher. There are a lot of pictures in this book, but not one for this recipe. If there had been a picture, it is likely I would have passed it by. But since I was scanning titles and ingredient lists (rather than browsing pictures) looking for a late summer recipe, I noticed this one. I love the red and yellow bell peppers of late summer (the hot house ones available all year pale in comparison). When I stopped to read the recipe, I was intrigued by its simplicity. And because it really is different than the chunky, vegetable "sauces" that I gravitate towards this time of year, I decided to give it a try. I was not disappointed. I have altered the original recipe in one respect: I roasted the pepper instead of chopping it up and adding it raw with the tomatoes. I did this first and foremost because the final sauce is puréed, but not strained. I didn't really want bits of tough pepper skins floating around in my otherwise smooth sauce. Roasting the pepper has the added advantage of concentrating the sweet pepper flavor. 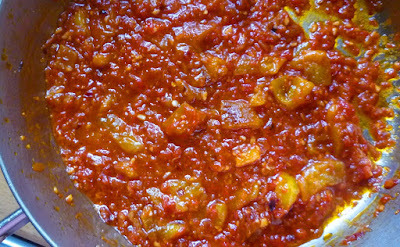 Furthermore, puréed roasted peppers create a velvety smooth sauce. There really isn't a downside to this change...unless you object to turning on your broiler (or grill). To this I would say that you can roast the pepper ahead...when you already have your oven or your grill turned on for something else. Or, if you really object, you could simply follow the original recipe: Core and seed the pepper and cut it into a quarter-inch dice. Add it to the pan with the tomatoes. Cover and simmer until the peppers are tender...about 15 minutes...and purée as directed. This simple sauce is delicious on pasta, but I have already been thinking about other ways to use it. I think it would be wonderful with fish (something hearty like swordfish...or tuna...). And its simplicity makes it perfect for pooling on a plate and topping with some freshly cooked gnocchi (tossed with a little olive oil or butter) and some shaved Parmesan. Pepper and tomato season will easily extend through the end of September...so I plan on making this sauce a few more times before the season is through. And since I'm certain this sauce will freeze well, I'll probably make an extra batch or two for the freezer. I think its bright summery presence on the dinner table will be the perfect antidote to a gray and blustery autumn or winter day. Preheat the broiler. Rub the pepper with a bit of olive oil, place on a small baking sheet or the broiler pan and broil until the skins have blackened and begun to split—2 to 4 minutes on each side. Cool. Peel and seed the pepper over a sieve set over a small bowl to catch the flavorful juices. Cut into an even dice and add to the juices. Set aside. While the pepper roasts, heat 1/3 cup of olive oil in a large skillet over moderately low heat. Add the onion along with a pinch of salt and sweat until very soft, about 10 to 15 minutes. Add the garlic and hot pepper flakes and cook briefly until the garlic is fragrant. While the onion cooks, prepare the tomatoes. Core the tomatoes. If using plum tomatoes, halve them lengthwise. If using vine ripes, halve them horizontally (through their equator). Scoop out the seeds into a sieve set over a small bowl (to conserve the juices). Discard the seeds. Using a large-holed grater set on a plate or pie pan, grate the tomatoes by holding the cut side of the tomatoes against the grater and grating until just the skin remains in your palm. Add the grated tomato pulp to the tomato juices. When the onions and garlic are ready, add the tomato pulp—along with a few good pinches of salt—and simmer gently until the sauce has thickened slightly (about 10 to 15 minutes). Add the peppers, cover and simmer gently to blend the flavors and finish softening the peppers—about 5 to 10 minutes more—and adding a splash of water if the sauce seems dry or tight. 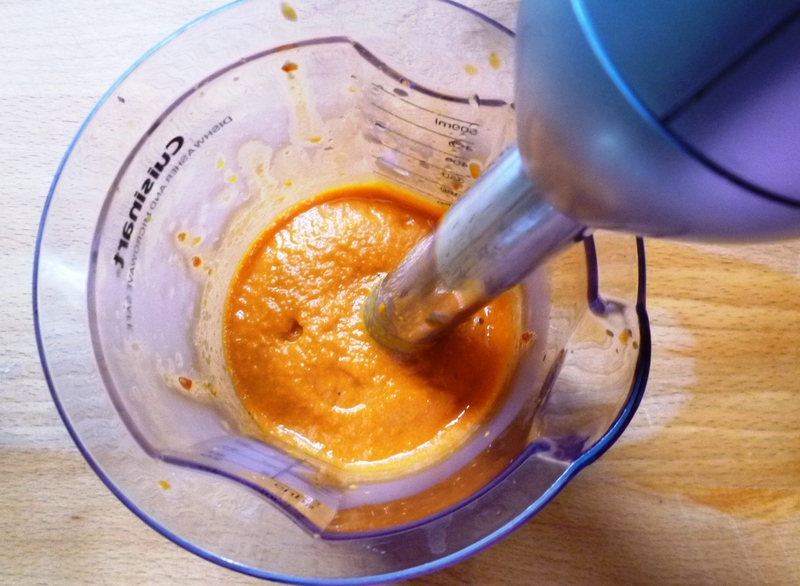 Transfer the contents of the pan to the blender cup (either a traditional blender or an immersion blender) and purée until smooth, adding water in small increments if the sauce is too thick to move well in the blender (see note). Scrape the sauce back into the sauté pan and taste for salt & pepper. Keep warm while you cook the pasta. Bring a large pot of well-salted water to a boil over high heat. Add the pasta and cook until al dente. 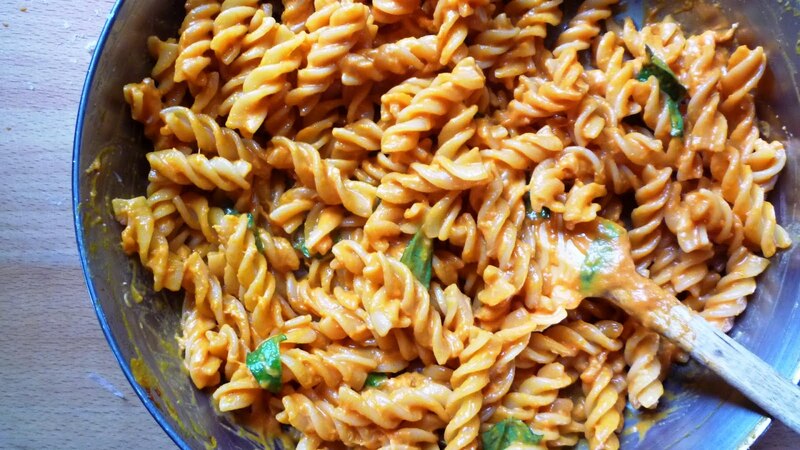 Set aside 1 cup of the pasta water, then drain the pasta. Add the pasta to the sauce and toss to coat—adding enough pasta water to create a fluid sauce that coats and clings to the noodles. Add the basil and the cheese and toss to combine. Add more pasta water if needed. Serve immediately, passing cheese separately. I prefer to wait to purée the sauce until I'm cooking the pasta so I can use pasta water to thin the sauce in the blender (if necessary). This may seem like a very small amount of sauce...but it is really just perfect. 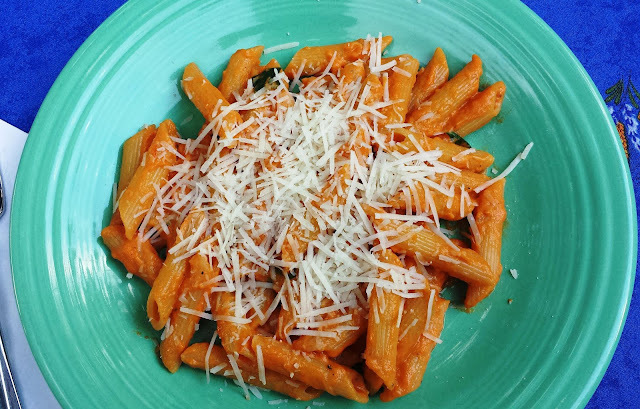 Pasta should be sauced so that there isn't a pool of sauce left on the plate when you are finished...rather, you should finish the last bite of pasta with the last bit of sauce. 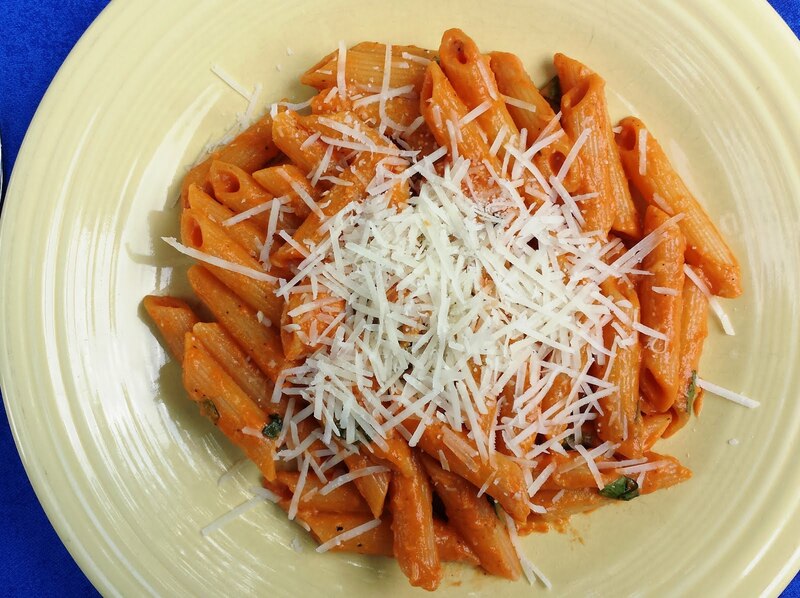 That said, if you like more sauce, simply increase the recipe so that the pasta is sauced to your liking.